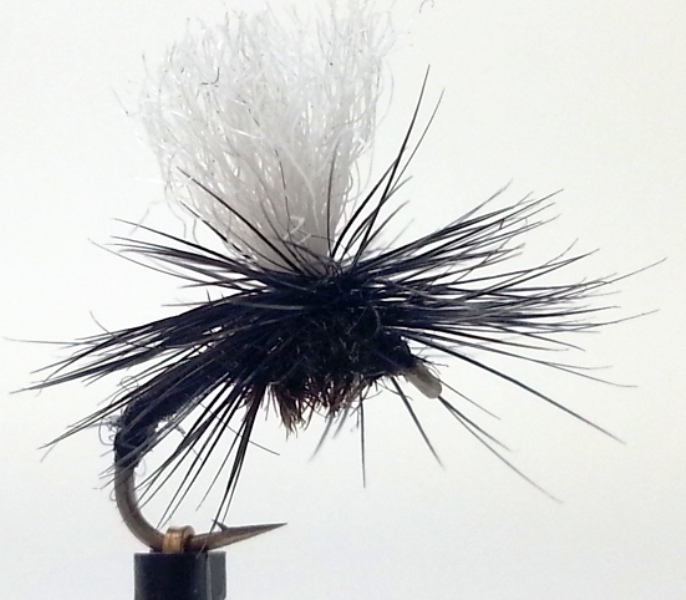 As the name indicates dry flies which include CDC Klinkhammer Black are designed to float on the surface of the water. Trout dry flies types which include CDC Klinkhammer Black imitate a wide variery of flies and insects which inhabit the surface of the water. There is nothing like using dry flies and watching trout and grayling rise to the surface. To purists dry fly fishing is the true art-form of fly fishing, indeed some rivers only permit dry fly fishing. There are some dry flies (e.g. the Popper, Muddlers) which are designed to attract fish by the action of creating a surface disturbance. The flies are made from very bouyant materials (e.g, cork, ethafoam or deer hair, the latter having a generous application of floatant). A Muddler retrieved upwind of a rise can often result in a bulge in the water as the fish follows the fly. The CDC Klinkhammer Black is fished by putting floatant on the wing post and moistening the body (I put it in my mouth and use spittle to make the body wet and sink into the surface film). The fly is then floated down stream with constant mends as appropriate to stop the CDC Klinkhammer Black skimming the stream as it must float naturally at the speed of the current.